Of the 21, five are from south Punjab. Governor Makhdoom Ahmed Mahmood administered oath to the 21-member Punjab cabinet at the Governor’s House on Monday. Chief Minister Shahbaz Sharif was also present on the occasion. Of the 21 ministers, five had also served during Sharif’s previous term. 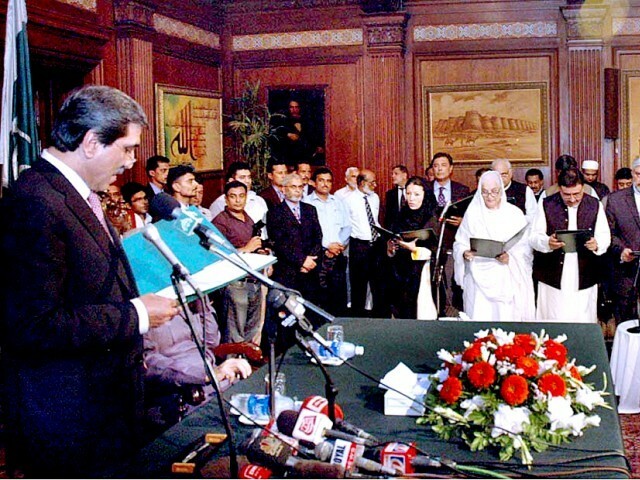 Azamul Haq, a technocrat, was appointed as the only advisor to the chief minister. Chaudhry Muhammad Arshad Jutt, Rai Haider Ali Khan and Rana Maqbool Ahmed were appointed as special assistants to the chief minister. There are no senior ministers in this cabinet. None of the MPA’s groups [Dhandla, Leghari and Kanju] that had contested the election as independents and later joined the PML-N were given portfolios. Sharif also did not pick veterans Chaudhry Liaquat (elected MPA six times), Chaudhry Iqbal Gujjar, Chaudhry Manazir Ali and Arshad Lodhi. Rana Sanaullah has been given charge of local government and community development and additional charge of law and parliamentary affairs. Rana Mashhood has been given the portfolio for school education and the additional charge of higher education and youth affairs, sports, archaeology and tourism. Mian Mujtaba Shujaur Rehman has been given the finance ministry with the additional charge of excise and taxation. Khalil Tahir Sindhu has charge of human rights and minorities affairs and additional charge of health. The ministers are Rana Sanaullah Khan, Rana Mashhood Khan, Atta Muhammad Manika, Malik Nadeem Kamran, Col (retd) Shuja Khanzada, Tanvir Aslam Malik, Mujtaba Shujaur Rehman, Zakiya Shahnawaz, Hamida Waheeduddin, Abdul Waheed Chaudhary, Bilal Yasin, Iqbal Channar, Dr Farrukh Javed, Raja Ashfaq Sarwar, Yawar Zaman, Asif Malik, Sher Ali Khan, Asif Saeed Khan Manais, Syed Haroon Ahmed Sultan, Chaudhary Muhammad Shafique and Tahir Khalil Sindhu. Congratulating the cabinet members, Sharif expressed hope that they would rise to the expectations of the people and discharge their duties efficiently. Talking to media, he said experienced, hardworking and capable persons had been given portfolios. They will work round-the-clock to address public grievances. When asked whether he would set criteria to judge the ministers’ performance, Sharif said the media would keep a check on them. Five of the ministers are selected from south Punjab, four from Rawalpindi division, four from Sahiwal division, four from Lahore division and the rest from Faisalabad. Sharif said his cabinet was a balanced team. Published in The Express Tribune, June 11th, 2013. The cabinet's degree of success will determine how the Sharif government is perceived in the long run. Nawaz, Shahbaz shortlist 15 ministers out of 30 aspirants. Most ex-ministers find their way into new setup likely to be unveiled today.